Heat the oil in a nonstick frying pan and sauté potatoes until lightly brown. Whisk the eggs in a cup then season with salt and pepper. 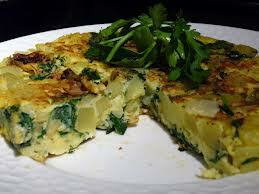 Pour over the potatoes and mix with spinach. Cover with a pan lid and cook over a low-medium heat for approximately four minutes then serve.